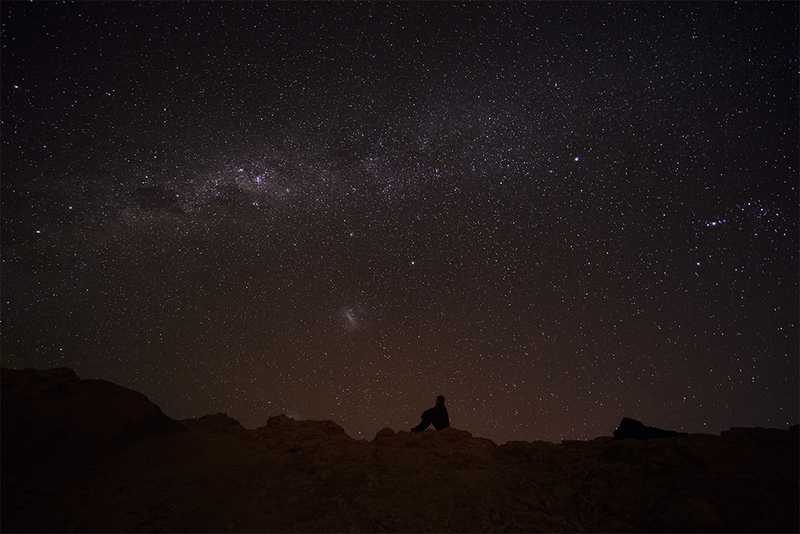 Enjoying the beauty of the nightsky in the Salt Cordillera in the area of San Pedro de Atacama. 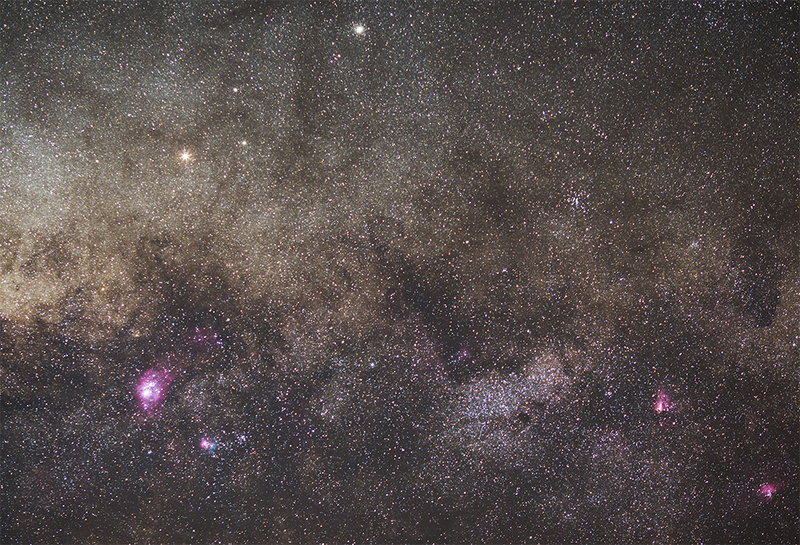 The band of the Milky Way stretches from Alpha Centauri (left) to Orion (right), with the Large Magellanic Cloud featuring prominently close to the center (the fuzzy spot below the Milky Way). 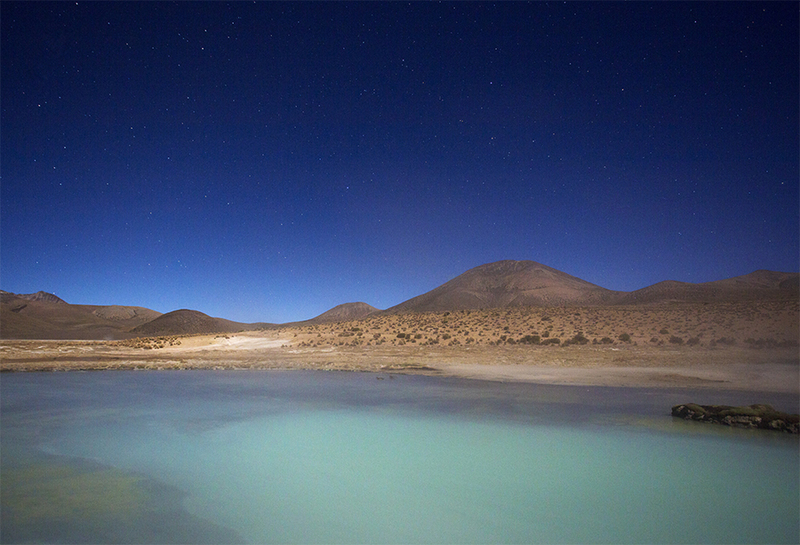 The Polloquere hot springs are located at 4318 meters in the Salar de Surire in northern Chile (Parinacota region). This is a very remote area that can only be reached by offroad vehicles on rather precarious roads (don’t forget to bring extra gas and lots of water). The thermal water is moderately to very hot, and thus perfect to warm up in cold temperatures. During our stay at the hot springs we had a full moon. 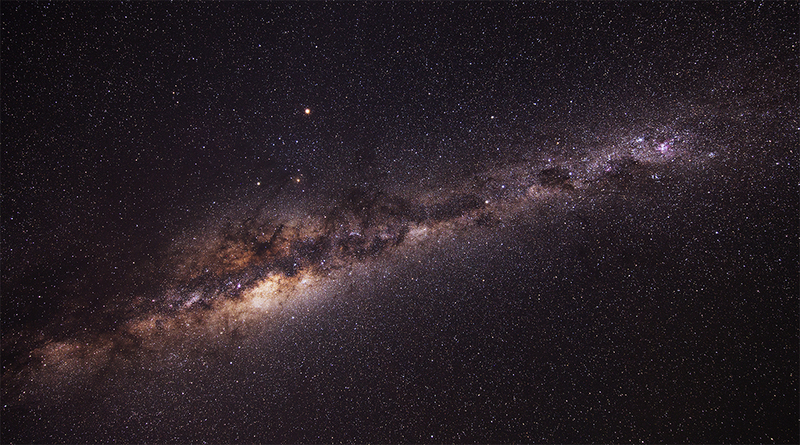 Although this is not ideal for astro photography, it nevertheless illuminated the landscape nicely and gave the sky an appealing blue tint. Rise of the full moon. 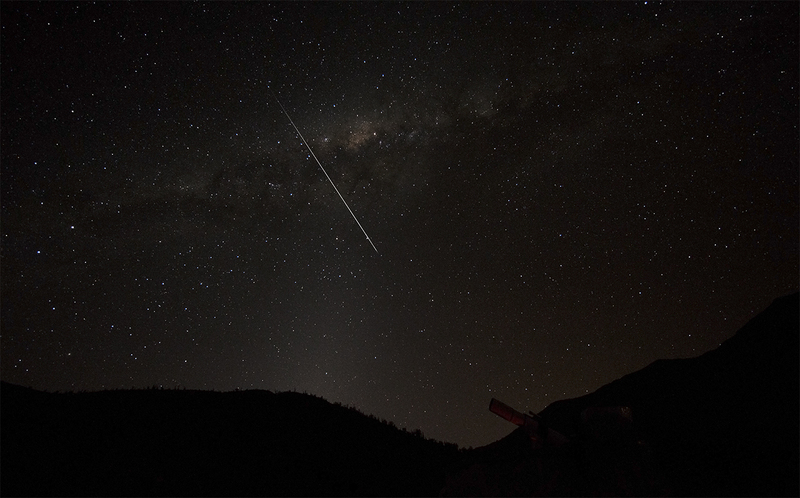 The two brightest stars of the nightsky, Sirius (right) and Canopus (left) are setting. 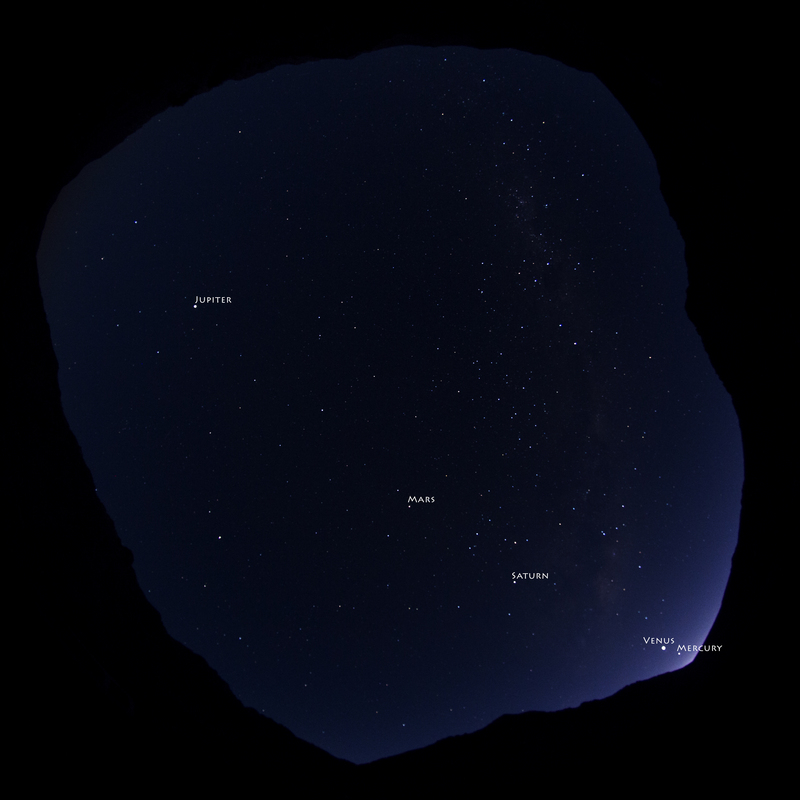 The Big Dipper, but on its head. Great campsite with lots of parking available. Frozen windows in the morning. Moon setting. Sun rising. The moon is setting behing the ridge on the right, while the first rays of the sun illuminate the mountain on the left. Lovely morning scenery. 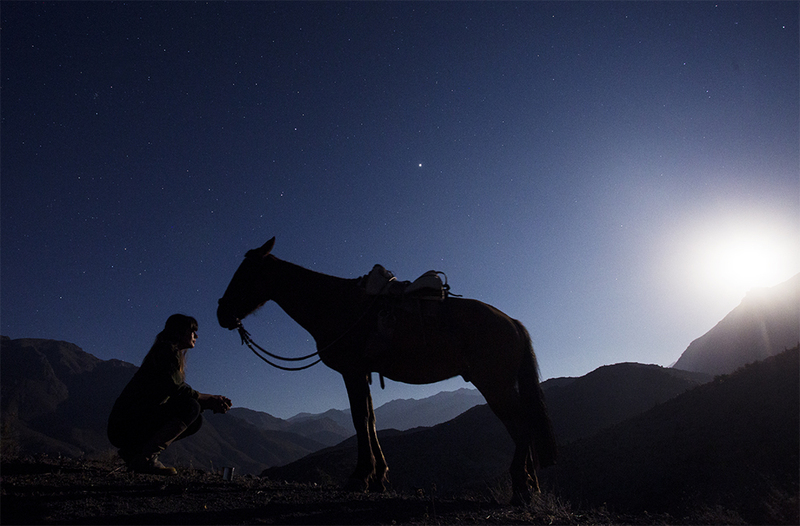 My all-time favorite: our starlight horseback ride. My friendly models this time are Denise and Chacay (one of our younger horses). Click to view larger picture. 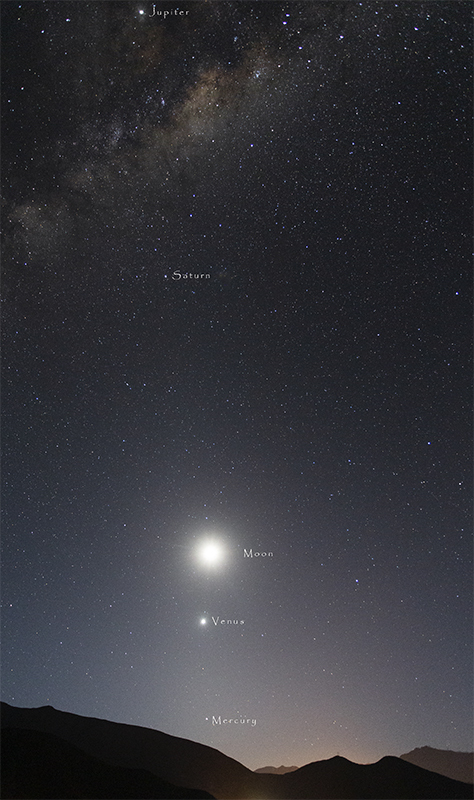 For the first time since 2005 all five visible (naked-eye) planets could be seen at once in the morning sky. 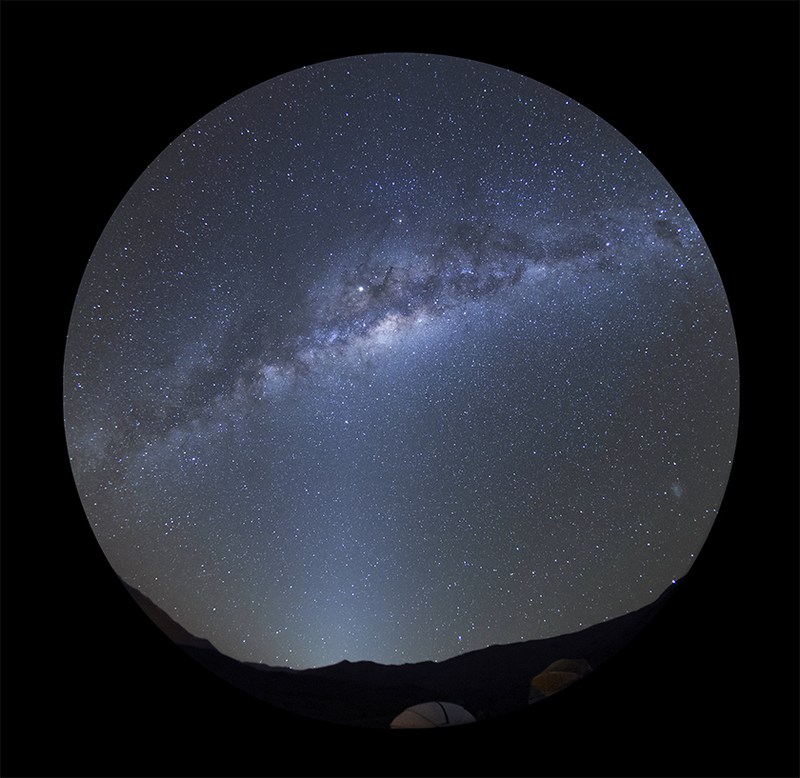 Since the mountain ridges around the Hacienda made it rather difficult to capture all five planets at once, I searched for a different spot, and finally got lucky in a high-mountain valley that provided the perfect view towards the east. Click on image to enlarge. 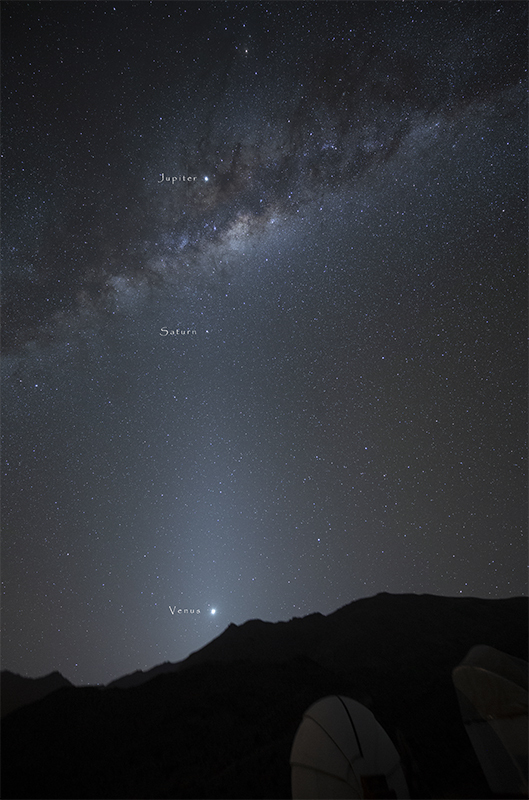 A lovely pair: Venus and Mercury in the morning sky (10 sec. exposure). 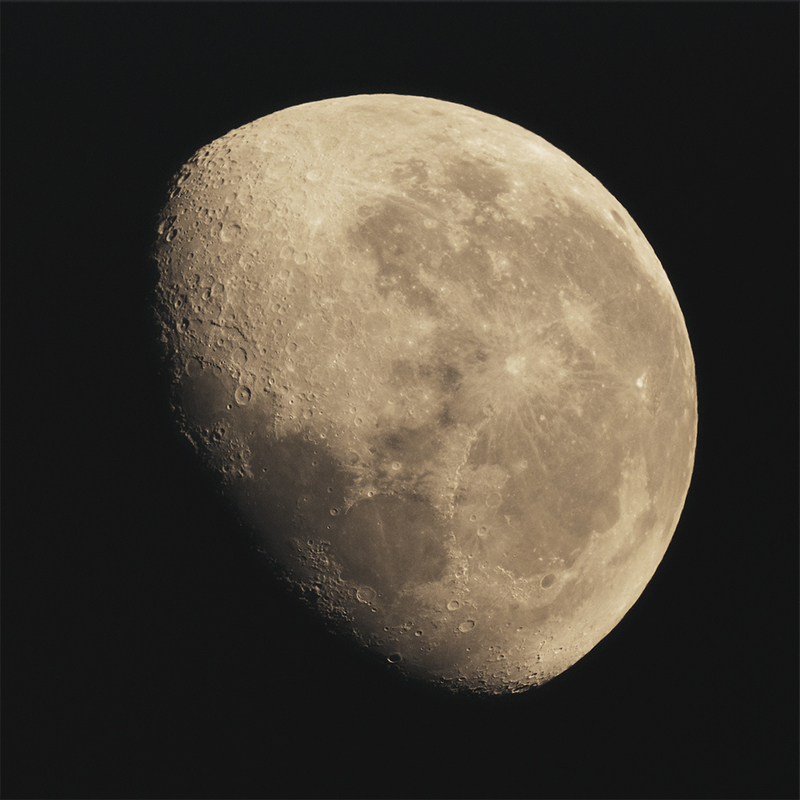 I caught the waning gibbous moon in the morning hours. 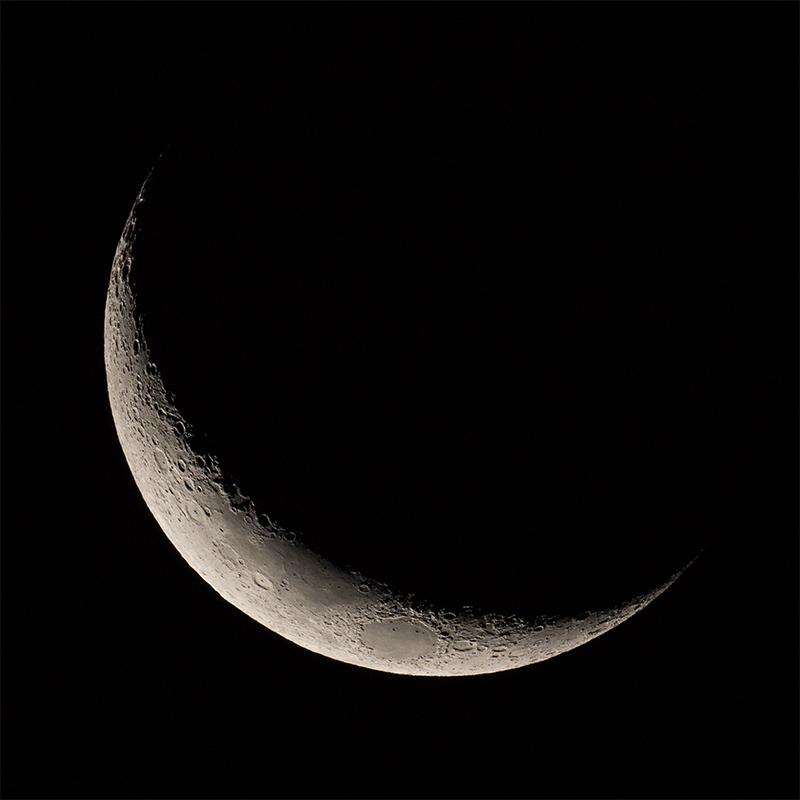 Approximately 77% of the lunar disc are lit. 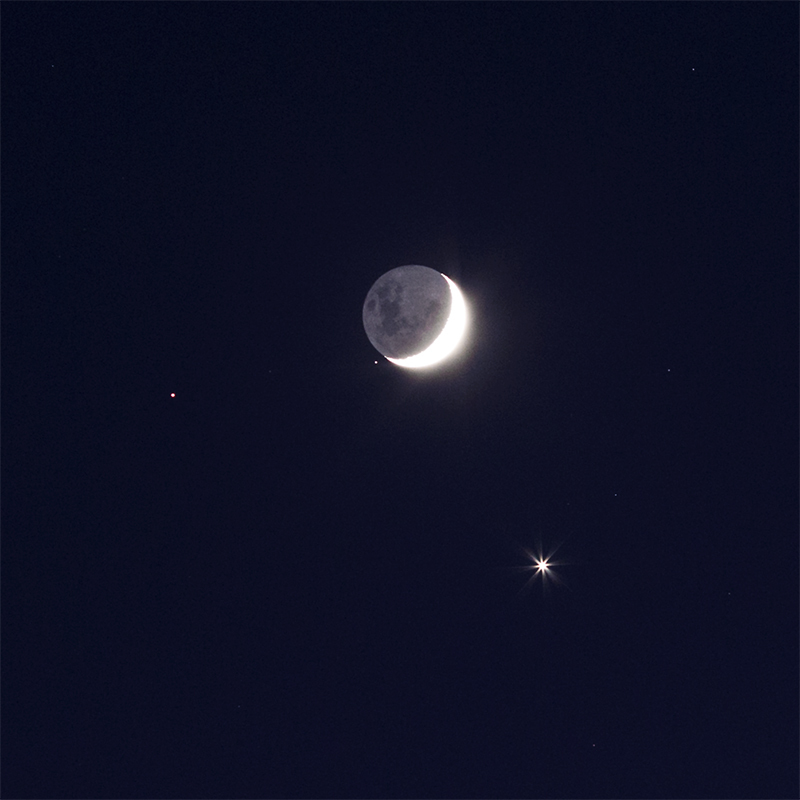 On the morning of November 7, 2015, the waning crescent moon formed a splendid triangle together with brillant Venus (lower right) and the much fainter red Mars (to the left). I took the picture in the wake of a 6.8 earthquake that had hit our region just an hour earlier, and send us all running out of the house. Luckily no damage was done. 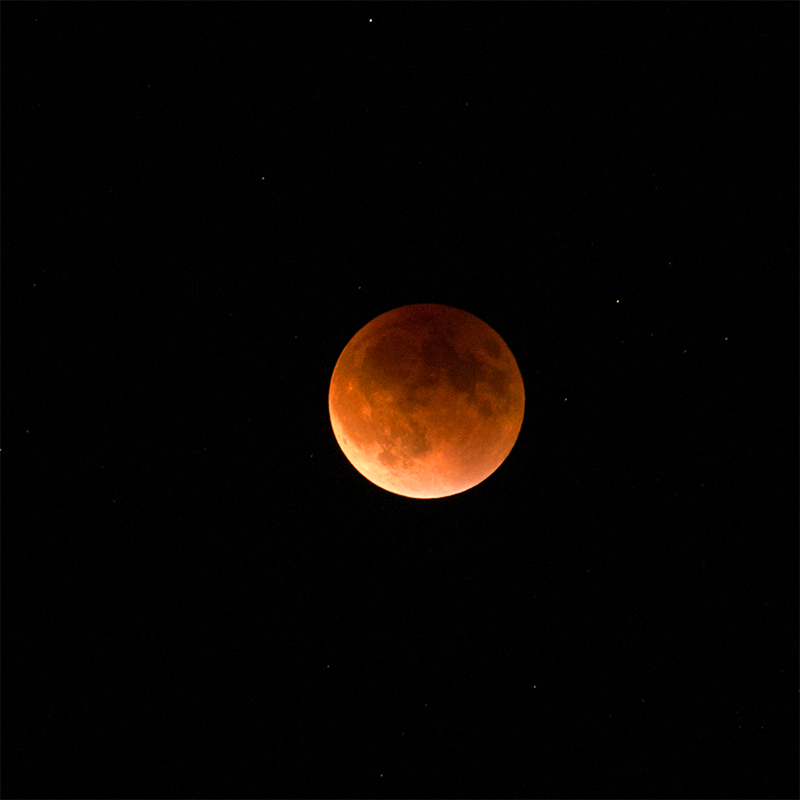 A magnificent spectacle as the waning moon joins the early-morning planet round-up. Jupiter can be found directly below the moon and brillant Venus shines in the lower right-hand corner. 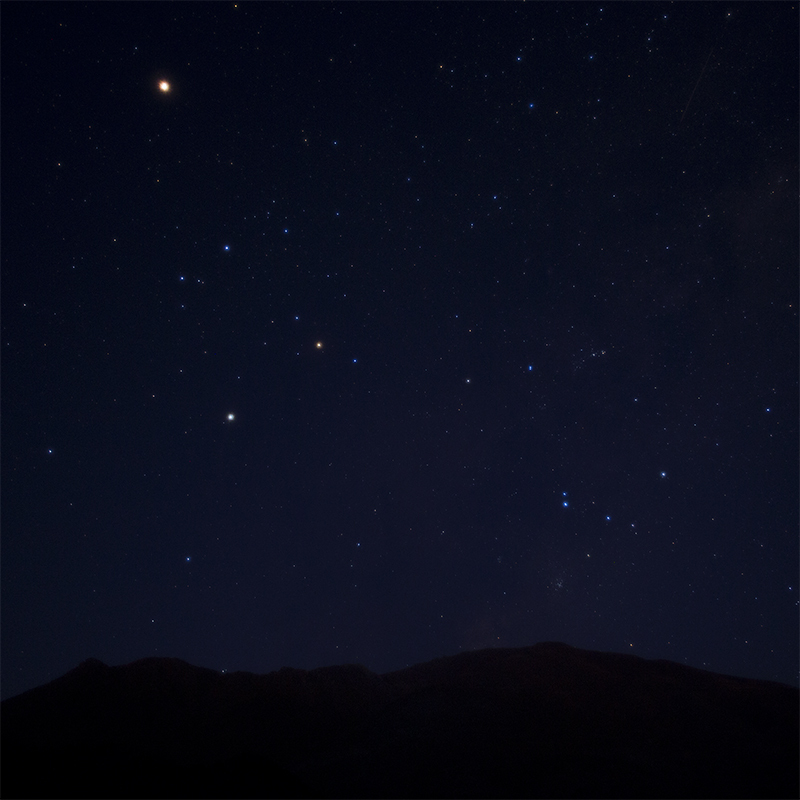 Much fainter is the planet Mars, the tiny spot just left of Venus. 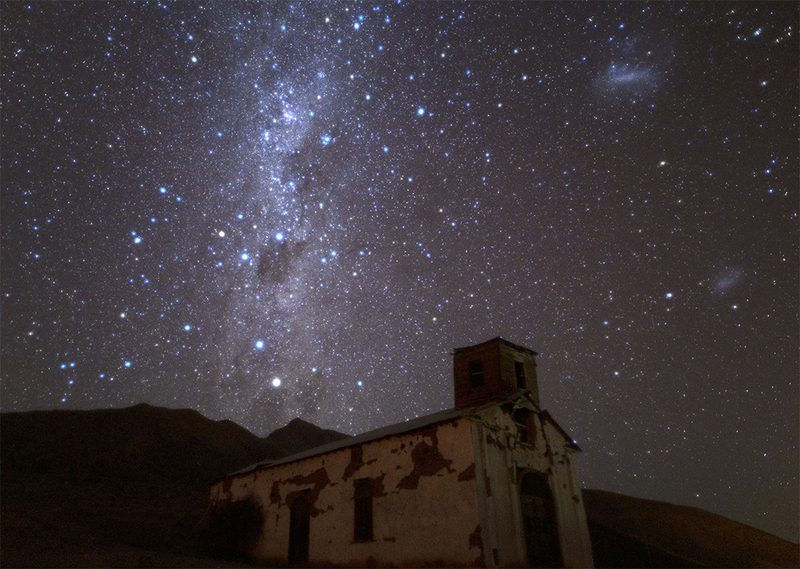 *A close-up of the heavenly conjunction. Enjoying moon-less and cloud-free (!) 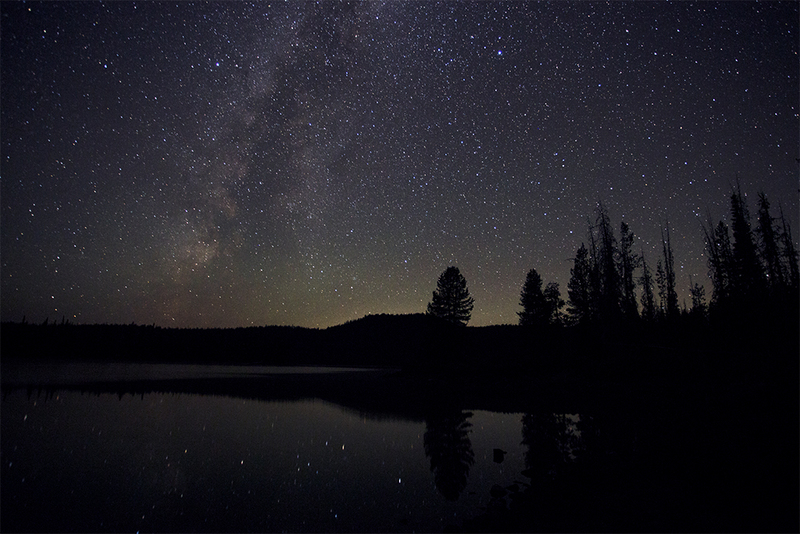 hours at Sparks Lake, Oregon. 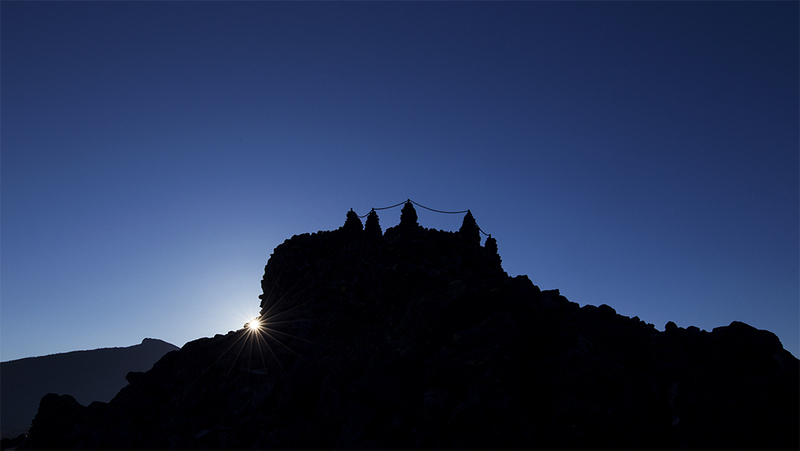 Daybreak at the Dee Wright Observatory, an observation structure built of lava rock, at the summit of the McKenzie Pass (1623 m) in Oregon. 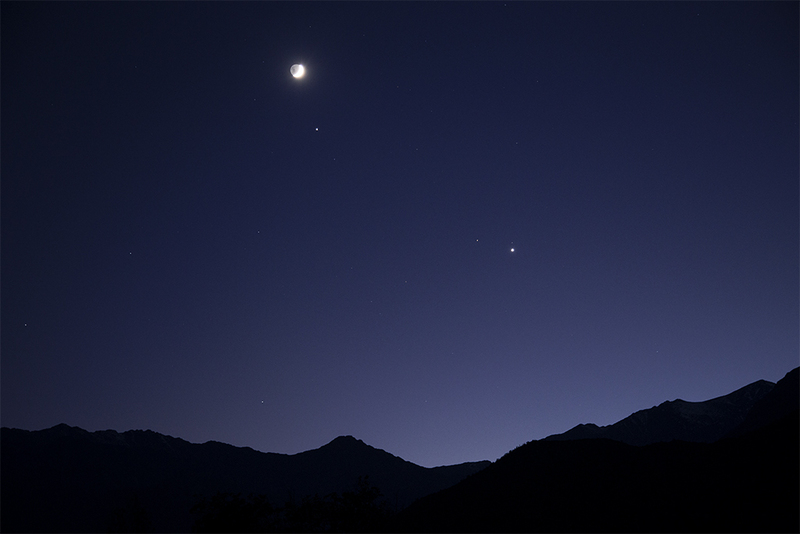 * The waning crescent moon and Venus pairing up at dawn. * The Belt of Venus and Earth’s shadow. 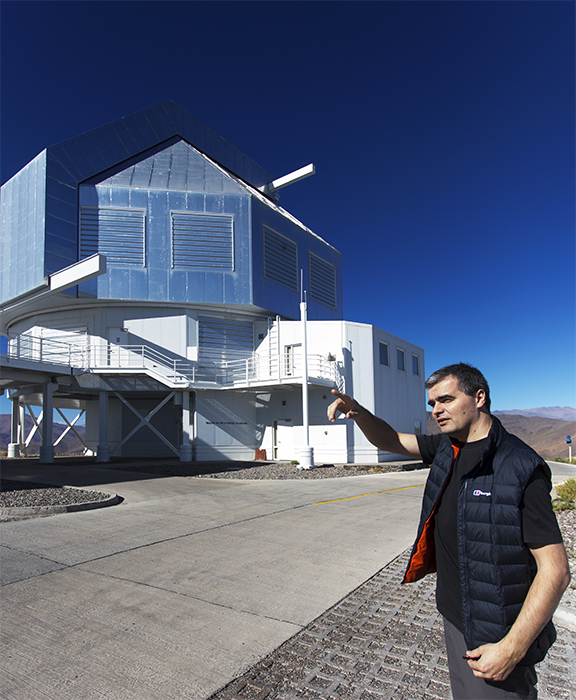 Thanks to Yuri Beletsky and the kind folks at Las Campanas Observatory I was able to spend a very inspiring and memorable night at Las Campanas Observatory.